I like my wines. I know wine, have enjoyed wine in France and local wine from every area of the country that we have inhabited. Red or white, call me a… what’s the word for a wine-lover? An oenophile. Yep, that’s me. I thought I didn’t like beer, until I realized that it is the hops that I don’t care for… lucky me, hop-happy San Diego will help me avoid swilling too many beer calories, or so I thought until I discovered Ballast Point Oatmeal Stout on nitrogen. Mamacita, is that a fabulous quaff! Now I want to try classic mixed drinks. Last Friday I tried a Gimlet, and loved it. This Friday I tried a drink that I had never even heard of- the Sazerac. And wouldn’t you know it, the couple sitting in the booth next to us knew all about this drink and its origins. 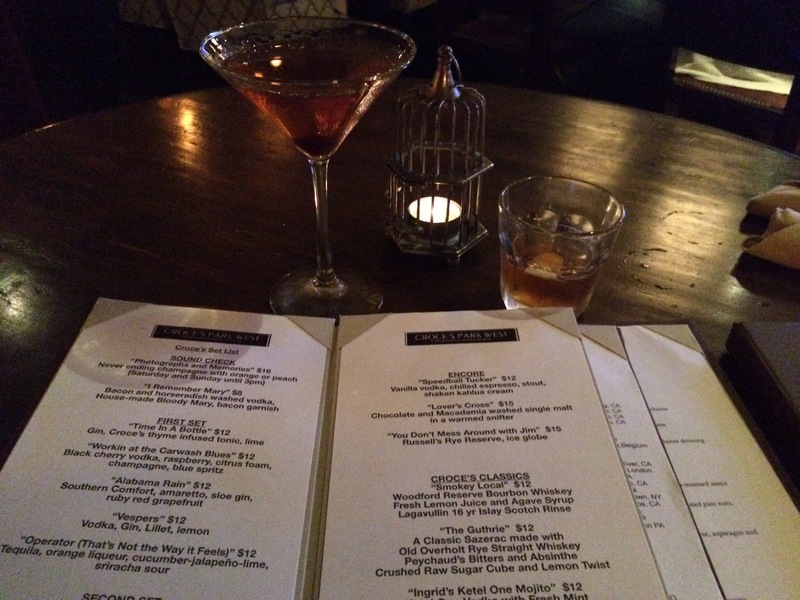 The Sazerac company has a pretty good summary, too, click to read if you are so inclined. It’s birthday celebration time for me, so, off we went to what we have decided is our favorite restaurant and bar- Croce’s Park West. A classic modern Sazerac has rye whiskey, bitters and absinthe. The drink was SMOOOOOOTH! “The Guthrie,” Croce’s version of a Sazerac, was so nice that I went from complete ignorance to complete fan after one serving. This is going to be the list from which I will be choosing new drinks to try! I don’t know what is worse: I haven’t even heard of half of them, or I have only tried about 7 of the 25.